Finally, after some brutally cold days this week (in which no records have been broken but should have been), a massive Arctic high pressure system responsible for the mid teens lows and highs in the 20s will be moving to our east. For those that know a little about weather, high pressure to our east means southerly wind and a better than average chance of some warming. That will be the case this time as well. 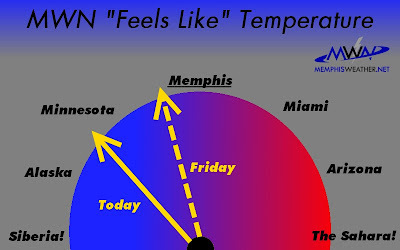 After one more cold day today (near 30) and cold night tonight (near 20), things start to improve and the "feels like" temperatures gradually improve from "Minnesota" to "Memphis." By this weekend, we'll be seeing low temperatures near today's high and afternoons reaching well into the 40s and perhaps low 50s. Another weather system moves in Monday with showers possible by late Sunday, but at least it will be rain. We'll be watching the tail end of the system carefully as temperatures could fall Tuesday while precipitation ends. A note on Mid-South winter temperatures so far: December ended up much below average (3 degrees) and January is beginning worse (-4 degrees to this point). Besides high heating costs, at the almost half-way point of meteorological winter, I'm beginning to believe that we could have a hard time ending up "above normal" for the season as generally expected in La Nina winters. If we do, there will haev to be some serious warming in the next 6 weeks. At this time of year, that can only mean one thing - severe weather. I think I'll stick with below normal, thank you very much! 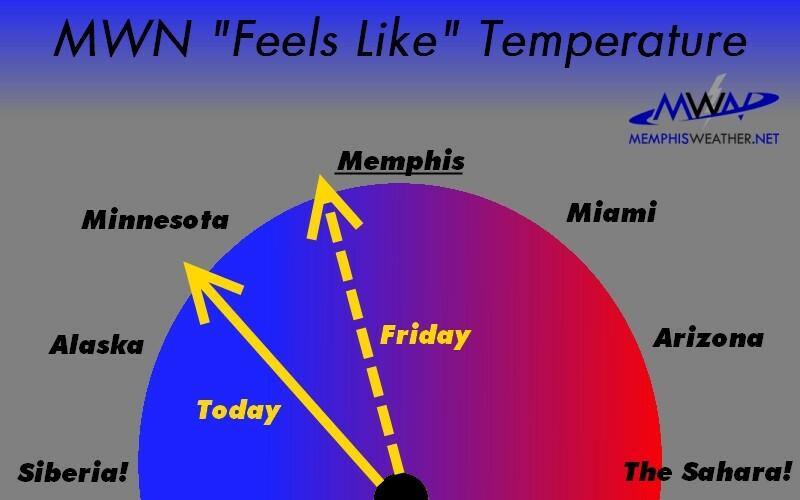 Where do you think we fall on the "Feels Like" scale above? Snow to 60s and back again!